Monika Rau is an urban planner, community builder and activist whose personal mission is to help shape Toronto’s growth as a city. She’s a forward-thinking individual who has spent her career focusing on planning, development, and real estate, as demonstrated by the wide range of titles she’s held at established firms and the breadth of her community and industry involvement as a volunteer. Monika caught the real estate bug at an early age. She was always fascinated by homes and developments in neighbouring communities not far from where she grew up and soon found herself scanning listings on the Multiple Listing Service (MLS). Monika knew real estate would always be relevant to her future and may even come in handy one day so she fulfilled the promise she made to herself to obtain a real estate license. During her undergraduate studies at Wilfrid Laurier University, her favourite courses were geography and environmental studies. However, it wasn’t until an urban seminar senior year that sparked an intrigue and curiosity between the intersections of urban geography, nature, and communities. This is where Monika discovered something she hadn’t heard of before: urban planning. After some initial research, she fell in love with this newfound world of urbanism and immediately applied to pursue a Masters in Planning in order to eventually become a professional planner in Ontario. She had found what would be her pursuit for the rest of her life. Monika chose to study at the University of Guelph’s rural planning and development program. She believed the broad, multifaceted education would help her in her career search – which held true. Similarly, Monika selected internships that she believed would provide a well-rounded foundation for real estate development, allowing her to understand its different elements, including people, their roles in the processes, what they looked for and how they functioned across the public and private sectors. Monika first interned with the City of Toronto Planning Division. This public-sector internship was critical to Monika’s professional growth as it gave her a foundational view of public service, how policies are formed, and the intricacies of the City’s approval process. She balanced this public sector exposure with an internship in the private sector, working at EcoVue, a private planning and development consulting firm. “It’s beneficial to gain exposure to different workplace cultures and a broad sample of projects from a private sector perspective,” she says. 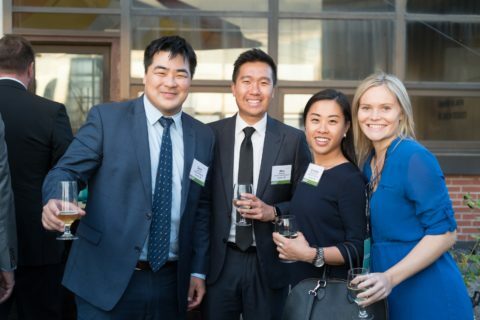 Monika’s full-time job upon graduation was with CBRE as part of their year-long rotational program which allowed her to work with the private capital, leasing, and acquisitions groups. She credits this experience in providing her with a broad perspective of the multi-faceted world of real estate, such as interacting with tenants and potential purchasers along with the process of always integrating the needs of different interest groups. Monika’s multidisciplinary approach comes in handy in her current role as a Development Coordinator at Dream Unlimited. In her first year at Dream, she worked on the CP Rail partnership, assisting in evaluating and determining highest and best-use scenarios for the railway’s excess lands across Canada and North America. After two years, Monika transitioned to Dream’s mixed-use urban development team and is currently responsible for helping her team to review and strategize future optimal development potential for Dream Office REIT’s portfolio in Downtown Toronto. “There is no typical day since municipal policies and politics are constantly changing. Every day brings a new circumstance and that makes it very exciting,” she says. Dream is project-driven, meaning a work day may include a variety of roles, from attending property tours, to reviewing architectural renderings or legal agreements, performing due diligence on acquisitions, working on site plan approvals, communicating with brokers, or completing market research. Her favourite part of her job is working with different groups, including politicians, consultants, and senior management, along the different stages of a development. The most challenging part of her work is balancing multiple projects, prioritizing tasks and keeping on top of deadlines, expectations, and the many revolving elements of each project. It’s evident Monika loves her job and the organization, describing Dream as having a supportive culture and executive management team, an open concept workplace to share ideas, and a focus on work-life balance. The organization supports her volunteering efforts by allowing Monika to maintain memberships with ULI Toronto and several other industry organizations. Approximately four years ago, Monika started attending ULI events and began volunteering to help with event setup. She made a point of speaking to presenters and panelists who participated in events and conferences she frequently attended. “It’s a great way to talk and network with the movers and shakers of Toronto,” she says. Monika credits her ULI involvement with helping her discover her current position at Dream. Volunteering has led to mentorship opportunities and allows her to consistently build a network of contacts which she finds imperative to both her professional and personal life. 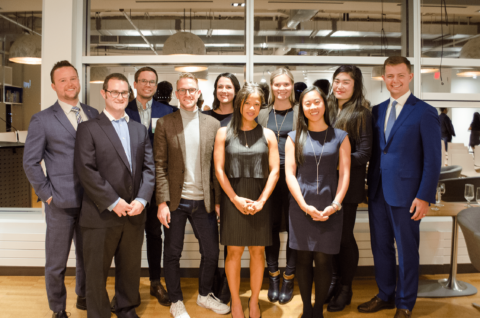 What began as an initial engagement turned out to lead Monika into a dedicated role sitting on ULI Toronto’s Connect Committee, an under 35 group which focuses on connecting high profile individuals with emerging leaders. As an advocate for public space, Monika’s other passion-driven volunteer role is with NXT City, a not-for-profit organization that connects young leaders with public and private city builders to create, activate and program public spaces in Toronto. After joining the organization two years ago, her involvement has evolved into a seat on the NXT City Symposium Committee in which she helps to program events and secure sponsorships. Monika also finds time to be a member and volunteer with Toronto NAIOP, Toronto CREW, the Canada Green Building Council (CaGBC) and the Ontario Professional Planners Institute (OPPI). When choosing a university program, Monika’s advice for millennials is to “know your interests and passions.” Rather than simply applying for a program, she also stresses the importance of contacting alumni and “friends of friends” who work in the industry to ask for casual coffee meetings rather than a formal Q & A. While in school, she recommends students try an overseas exchange program to see how other cultures approach and address challenges, whether it be in urban planning or their choice of study. “Be a generalist since multifaceted skills are needed for development, let alone many walks of life” she says. For those seeking careers in planning and/or development, Monika suggests joining and volunteering at ULI and other industry groups as mentioned above. She also recommends finding a solid mentor who can assist in network building, act as a career coach, and who can ultimately be a resource for evaluating different ideas and opportunities. “Be active in your community, participate in workshops and conferences and build your network,” she says. Social media is key and Monika highly recommends using multiple platforms such as LinkedIn and Twitter in order to establish a presence, build your own brand, and stay relevant. We are pleased to announce that Toronto has been selected as the host for the 2018 ULI Hines Student Competition!